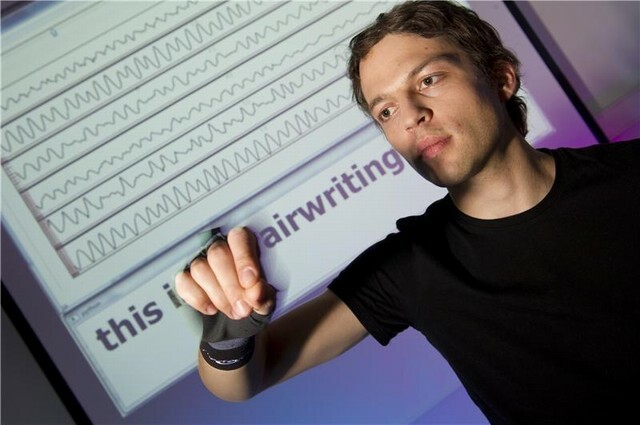 Computer scientists at the Karlsruhe Institute of Technology have developed a way to write using only the motions of your wrist. It’s something for those of us who just can’t be bothered to type, let alone hold an actual pencil. Actually, this new tech was developed with smart phones, tablets and future technologies (like Google’s Project Glass) in mind, which typically lack proper keyboards or other input types. The ability to simply gesture into the air and “write” does away with the problem of clunky, external inputs altogether. So maybe someday we’ll all write using our special wrist-writer thingies, and charge them with our fancy Power Felt t-shirts (that’s nanotech fabric, don’t you know).